Is something still as special if they have it daily? Doesn't that make it part of the regular menu? But I digress, the fact that you can get chickpea curry with fried bread is special enough for me. 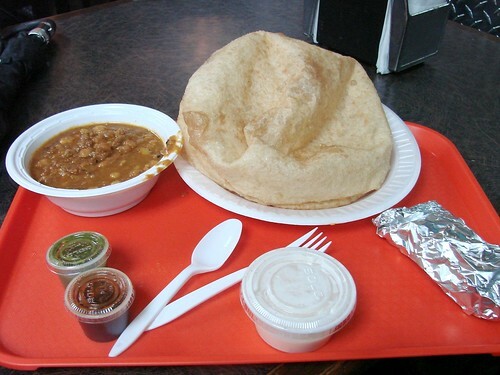 For $5.95 you get a dish of chana (chickpea) curry with a side of raita and mini cups of tamarind sauce and cilantro chutney and not one, but TWO fried breads. Sweetness. The bread is made to order and comes out hot and fluffy. The center is thin and puffs out with cooking and the edges are delightfully tender and chewy. The chana curry itself is nicely spiced, not particularly hot, but very flavorful. Winner. 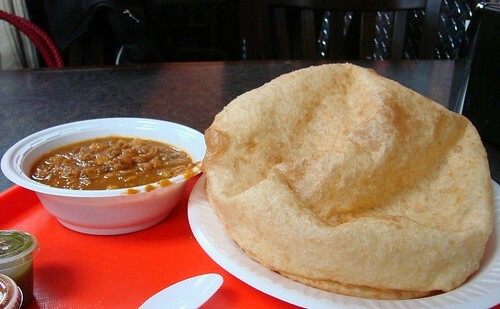 In terms of mealtime strategy, I recommend going with a friend getting an order of the chana bhatura and then another curry dish over rice that would go well with fried bread (and come on, what curry wouldn't go well with fried bread?) That way you can make good use of having 2 fried breads and get a little more variety. Hmmm looks delicious! I love curry!